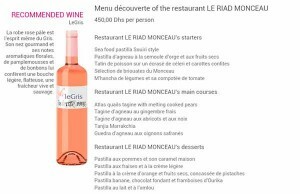 29 Dec RIAD MONCEAU, magnificent dinner in main square area. Riad Monceau is an old riad of the 18th century nearest to Jmaa Lfna, the Main Square of Marrakech. Royal quail tajine with fondant pears, chocolate pastilla with walnuts… – these are just two examples of the delights awaiting discovery in the elegant and highly exclusive setting of Restaurant Riad Monceau, one of the finest Moroccan restaurants in Marrakech famed by the world famous MarrakChef® gastronomic trophy. 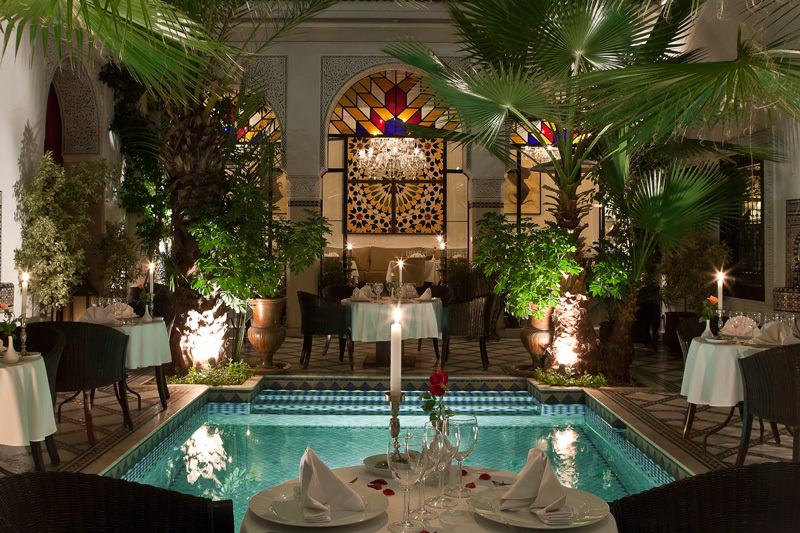 Set in a true gem of the Hispano-Moorish architecture Riad Monceau restautant provides a perfect setting for a romantic dinner, for a special event such as birthday or an anniversary, or more simply for an outing with friends who appreciate the finer things in life. Whether you choose to enjoy your meal in the gorgeous restaurant’s main room, by the fireplace in the plush ness of the lounge bar, in the intimate atmosphere of the private dining room or else in the most romantic ambiance of dazzling white surroundings of the patio with its famous lovely swimming pool inlaid with traditional mosaic, you will be served a delicate and subtle cuisine that harmoniously combines the finest that genuine Moroccan gourmet cuisine has to offer with the best of French haute cuisine refinement. Whatever the choice for your Moroccan meal – outside setting or inside setting – the exquisite restaurant’s Moroccan specialties are to be savoured within the “Discovery Tasting Menu”, a culinary voyage that Rachida Sahnoune, Chef of Restaurant Riad Monceau, creates every morning exclusively from the day’s fresh market produce. The Discovery Menu consists in a choice of 2 starters, 1 main and 1 dessert, followed by the traditional mint tea. Its price is 450 MAD (40 euros) per person, drinks not included. aurant specialises but also a wide range of cocktails and alcohols as well as selected French Champagnes.